Warning that it will not tolerate illegal hawking because of the health risks involved, the National Environment Agency (NEA) said it has taken action against two illegal hawkers after they sold food such as mee bakso (meatball noodles) from a field in Paya Lebar over the weekend. 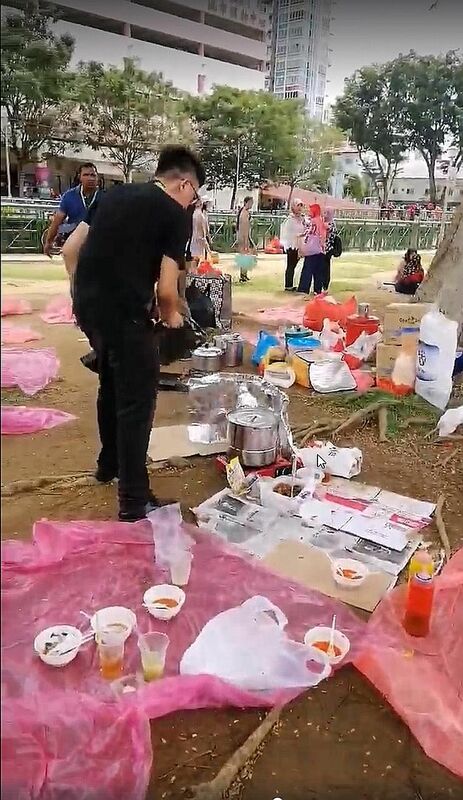 The site was inspected on Sunday, and a video of the incident, which was uploaded to Facebook, shows three NEA officers placing the food items into trash bags. Plastic sheets could be seen strewn beneath a tree where people were gathered. Many bags and containers, believed to hold cooking materials and raw food, were placed on the ground next to the tree. The video also shows officers clearing a cooking pot on a portable stove. A woman can be heard speaking Bahasa Indonesia in the video, warning others of the enforcement action by the Singapore authorities. The area next to City Plaza is popular with foreign domestic workers, and many of them gather in the area on weekends. The spokesman said NEA received four reports of illegal hawking of food there this year. "NEA takes action against illegal street hawkers, whether locals or foreigners, as unregulated street hawking impacts public health and safety," she told The New Paper. The public is advised to report illegal hawkers by calling the 24-hour National Environment Agency contact centre on 1800-CALL-NEA (1800-2255-632). Those found hawking illegally may have their goods seized and be fined $300, $400 and $500 for the first, second and third offences, respectively. Upon the fourth and subsequent offences, they will be prosecuted in court.